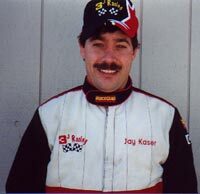 Pro Am driver Jay Kaser was chosen for the Dirt Driver Spotlight due to his recent successes and his hard work and dedication in the sport of racing. Kaser was born and raised in Pender, Nebraska.� He excelled in high school sports, belonging to his high school's football and wrestling teams.� During that time he also had an interest in tinkering with cars. He remained in Pender throughout high school, but decided to make the move to Lincoln to go to college.� Kaser attended Southeast Community College, earning his associate degree in auto mechanics. In 1996 Kaser decided to get serious about racing. "I always loved racing, so one day I just decided to go out and buy a car," said Kaser. 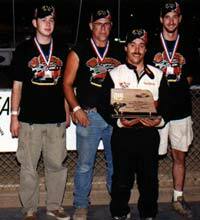 He worked on the car all winter and raced it in the Pro Am class at I-80 Speedway in 1997. Kaser has made steady improvements each year. The first couple of seasons he made his way through the learning curve that all rookies face. By his third season, he came very close to winning his first A Feature at Eagle Raceway, only to have a late race caution allow one of the racing veterans to close the gap and eventually force Kaser to settle for second on that night. For the 2000 season, Kaser decided it was time to upgrade to a better car and aim at doing all he could to make a run at the Eagle championship (he kept his old car complete as a backup car, with crew member Jason Clark behind the wheel at Eagle throughout the season). At the same time, he knew the competition was going to make that a tough goal to attain. Several DNF's, mostly due to flat tires, hindered Kaser's efforts in the championship race, but Jay finished a very respectable fourth in the final points standings. However, it was the runs along the way that were most impressive. He nailed down that first feature win in the middle of the season, and then backed it up a couple weeks later by dominating the field for his second win of the season. The success continued at the end of the year as well with a second place finish in the State Championship race at the State Fair in Lincoln. Kaser plans to keep racing as long as he can, and someday wants to see his sons race. "I would like to see my kids involved in racing," said Kaser.� "I want to get Jase involved in mini sprints next year." Kaser is a supportive father who wants to see his children succeed at whatever they do, but the one thing he wants them to shy away from is wrestling. "Wrestling is too demanding on your body," said Kaser.� "When I was involved I hated to watch the guys who had to cut weight or gain weight.�I'd like to see my boys do something else." For the time being, the boys, along with Jay's wife Shari, enjoy cheering their dad on from the grandstands each week. When Kaser isn't working on the race car, he and Shari keep plenty busy operating their painting business - Kaser Painting, Inc. Jay's love of the sport of racing also led them to sponsor the Kaser Painting Pro Am division out at Eagle Raceway this year. In his spare time, Kaser enjoys listening to music by Shania Twain and watching the television sitcom "Everybody Loves Raymond." But most of his hobbies center around racing. Jay is currently in the process of deciding whether to make another run at a Pro Am championship or make the jump up to the Limited Late Model class. "A lot depends on whether I can get the Pro Ams sold," said Kaser. Judging by how competitive Jay has been this season, there will surely be lots of interest in his cars by other racers. Kaser would like to thank his sponsors who help make his racing efforts possible. Besides Kaser Painting, Jay also receives support from ICI Paints, Devoe Coatings, Lincoln Financial Services, Mann Custom Homes, Pinnacle Bank, Iowa Paint, Diamond Vogel Paint, Sherwin Williams, Insurance Business Services, Harris Decals, Willard Automotive Machine, Star City Auto Salvage, and Design Wear. Jay's pit crew consists of Crew Chief Ken Northup, Jake Northup, Jason Clark, and Dennis Smith. Jay would also like to extend a big thank you to Shari, Jase, and Jared for all their help and support. Kaser has been someone to watch this season and will continue to strive for excellence in the years to come, regardless of which class he winds up in for the 2001 season. Keep your eye on the 3j!